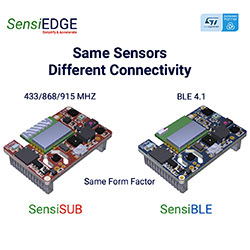 30 August 2018 – Tel-Aviv, Israel: IoT expert SensiEDGE have released a new SensiSUB SoM starter kit, a board-level IoT sensor node. The kit delivers higher range and more reliable frequency bands to penetrate obstacles and reduce interference. The new device is perfect for advanced IoT applications, as well as smart home, smart factory, smart grid and smart city deployments. The device features a low power ARM 32-bit Cortex-M4 CPU with FPU, and a range of serial interfaces (including SPI, I2C, UART, ADC, CAN, USB and GPIO), combining a SPIRIT1 low-power RF transceiver from ST, which provides certified sub-1GHz connectivity (in three frequency versions: 433MHz, 868MHz and 915MHz), with a suite of fully customisable sensors (including three-axis accelerometer, magnetometer and digital gyroscope, plus pressure, microphone, ambient light, relative humidity, temperature and UV sensors). The device’s hardware-ready configuration offers a complete, self-contained RF platform in a small form factor (20mm x 30mm) that facilitates wireless connectivity without prior RF expertise. As such, it is ideal for a broad range of target markets and applications that necessitate rich functionality, including industrial lighting, smart metering and home and building automation. The reduced interference, long range and low power features of the sub-1GHz spectrum band make it a perfect fit for these IoT applications.